Growing up, it was far easier to read the novelizations than to watch the actual episodes. The episodes were usually on well past my bed time and each complete story arc was typically broken up into something like 4-6 half hour installments on PBS. Very easy to miss episodes. I read and re-read The Horns of Nimon over and over again. And again. It was one of my absolute favorites and it was recently rediscovered in my mother’s home. She mailed it to me and I read it again. The story has also sorts of little references to the legend of Minotaur (Skonnos=Knossos; Seth=Theseus; Anethans=Athenans; Nimon=Minotaur). 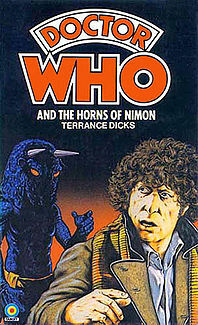 The novelization, as is common, was written by the primary script writer for that season. It’s not literature. It’s short. Everything is, at best, adequate. Unless you watch a lot of Doctor Who, because sometimes, when reading, a line that seemed dead on the page, suddenly came alive, because it was a line by the Doctor and I could hear Tom Baker, who played the Doctor for this episode and who, of course, was the greatest Doctor, deliver the line.